Looking for a sole trader invoice template that's won't cost you an arm and a leg? We've got you covered. Plus, it's free! Do I need more than just a sole trader invoice template? Just because you're the boss, does not mean that you have to do all the work yourself. ZipBooks has created a sole trader invoice template to make your life so much easier. With our template, you can easily design your invoice once and then save it for any future needs. But that's not all we offer. We have a system set up so you can automatically bill your regular clients without having to create a new invoice every time. And we have even created a system so you can automatically send emails to remind clients when they have forgotten to pay. What should I include on my sole trader invoice template? Using ZipBooks for your sole trader invoice means never sending off an invoice without your own company’s information on it (oops!). 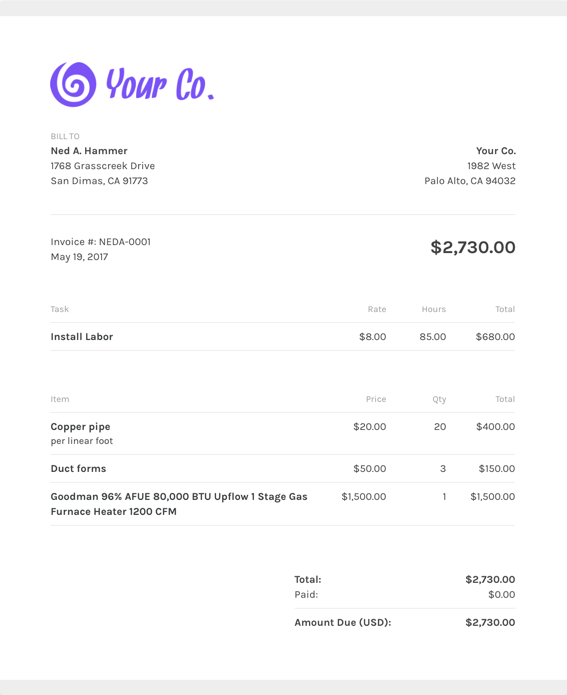 We’ve collected data from tens of thousands of invoices and use it to score your invoice based on what information you include so you’ll get you paid faster. Why should I use ZipBooks’ sole trader invoice template to create and send my sole trader invoice?